Top Dog ČMKU 2012 & 2009 - 3rd FCI I.
Dargy is a real orange plush dog, of an excellent character and great attitude. He lives in a common household in a family with a child and old Chihuahua male together. 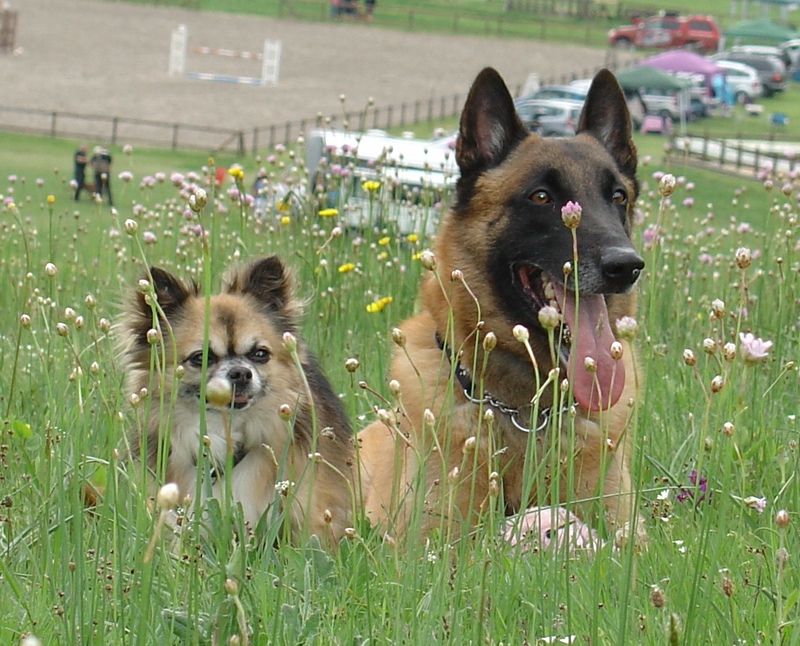 Although exterieur blood lines, Dargy is active and successful in several dog sports of various levels also. For us, he is the typical representative of Brain & Beauty. Bred through the s.r., P.E., a. Int.Ch. BAIN Alké, IPO3 SchH3 ZV3 A3 (2/4) back to s.r.Int.Ch. DRECK de la Terre Aimée, Ring3 (3/5) and to Int.Ch. MERO du Maugré (3,4/5) and legendary reproductors as Iago, Kami and Gawrain du Maugré. Hot New: born litter in "Sweet Vulcan" (B) - exterieur line breeding from Kato Sweet Vulcan! Out of plans Dargy passed FPr3 exam (tracking of IPO3) for 79 pts.! After a loooong relax (8 months on the couch) one of my friends invited us to attend the exam-weekend in Ceska Lipa: well, the only exam we could pass was FPr3 (part A of IPO3). We did one training track before - and it looked good... so we came and stand at FPr3 outset... Dargy did well, with an excellent low nose work, with sure curves in pretty good pace, BUT unfortunately he did not marked any of three objects (although he stopped by each, he didn't stay)... well we lost 3x 7 points out of 100 and we really got the "full" rest: 79 points for the precise work! Not bad if no training and immediately after such a long training break! 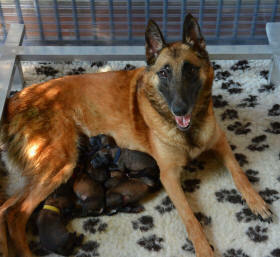 New expected litter in "vom Lahberg" Kennels (D) from pure working female Farida vom Lahberg. Please watch "pregnancy diary" directly on breeder's HP - it is stunning!! 17.7.2014: Kato brought 7 puppies to the world! They are 5 males and 2 females! 18.6.2014: Farida vom Lahberg visited us with her breeder Armin ;) They came from Germany. Thank you for so high thinking about and for choosing our male to mate your cute Farida!